Extreme progress is being made on the home of Shaun Meadows--a veteran whom will be receiving a brand new, mortgage-free home, compliments of LP Building Products, Goodall Homes, and their subcontractors, who have partnered up with Operation Finally Home in this project. Together, this is a way to show our appreciation for the sacrifices made by Shaun and so many others for our country's freedom. 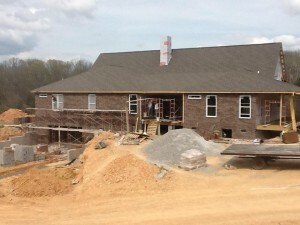 Currently, Shaun's new home is being bricked, while trim work is beginning on the interior of the home. A Welcome Home Celebration is scheduled for Memorial Day weekend to welcome Shaun and his family to their new home.